Congrats to my fellow writer Liz Prato, who won third place in the Juked Fiction Prize, judged by Frederick Barthelme. Nicely done, Liz, crack open the champagne! Without naming any names, I feel duty-bound to pass this on as a cautionary tale about the big, bad world of not-real short story competitions. A few months ago I submitted a very short story in to a contest run by an online writing group for a £6 fee. I didn't check the terms and conditions of entry; i.e. what might happen if I won or got placed. Now it has come back to bite me. I was named as a finalist and was delighted to hear that my story would be published in the competition anthology. I received an email a few days ago that the anthology has now been published. So I reply, asking innocently "I assume that contributors receive a free copy?" So I am now expected to shell out a further £8 to buy the anthology. Which means that I have spent £13 to get my own story published. What have I won here? Ladies and gentlemen, the lesson is this: check the fine print before you submit. And check it again before you agree to be published anywhere. I feel that a free copy of an anthology is the very least a competition can offer, since I already paid to enter! Unless this isn't a real competition at all, simply a way to generate content and 100 willing buyers. You make up your own minds. I used to be a little obsessed with all those TV shows involving lawyers, cops and solving gruesome murders, but I've recently discovered what a difference it makes to my mood - and my ability to sleep at night - to watch things that make me laugh. Two quick tips: 30 Rock and The Big Bang Theory, both very silly and very funny! Enjoy. So, I've taken the plunge. I've signed up for NaNoWriMo. For those of you who don't know what this is, it may sound like torture. It stands for National Novel Writing Month, and the original idea was to stimulate writers who don't think they can write a novel, setting them the goal of writing 50,000 words in 30 days. The point is that these are not 50,000 good words, they are just 50,000 words. This is to show people they can produce quantity, and give them a rough draft to work on. You upload your daily writing to the site, which counts them automatically (no-one else sees your writing) and keeps a tally. Anyone who makes it to 50,000 is a "winner". I signed up two years ago. Me, who has never written anything longer than 6000 words. I wrote a few hundred, and spent all my time in the forums moaning about how I couldn't write anymore. Now, when I seem to be comfortable with stories of less than 700 words, I decided it was time to push myself. This time, though, I have a support group: six or seven of my fellow Fiction Workhouse members are taking the plunge together and egging each other on. We don't start til nov 1st, but already I feel calmer. I actually have a main character already, someone from one of my short stories who intrigues me. But that is as far as I get. I have no plot, no novel-length story idea. And that terrified me. I found a few others on the NaNoWriMo forums who are in the same position but most people seem to have plotted their novel out. I was panicking a little. Until this morning I was firmly in the camp of the non-plotters. I've never plotted a short story before writing it. Hmm, but then I've never written more than 6000 words. However, today, I was shown a whole new way of working. I am taking an online screenwriting class, with the idea that we all write a full-length screenplay. I have had an idea in my head for a few years - but just an image, a beginning, a concept. Nothing else. One main character. I've tried over the years to just start writing the script and seeing what happened. But that just didn't work. Today, however, I read the 2nd lesson that the instructor posted online, and in half an hour, following the guidelines, wrote an entire synopsis/Story Map of my film, with beginning, middle and end. The story unfurled as I wrote. Now I have the plot. And it may well be that the plot will change radically as I write the actual script, but I have somewhere to start. I thought this might help with the novel, as well. I don't know - since I have never written a novel - which parts of this are specific to films, but I have a feeling it's quite similar, just adjust the terminology accordingly. So, tomorrow I will have a go. We'll see if I get anywhere. What do I do to avoid writing? One thing that is excellent for wasting hours is redesigning my website. Tweaking, changing colours, trying out a new layout. Hours and hours... Much better than washing up. What do you think of the new design? Do the pictures slow it down? Is it eye-catching or a bit too much? Comments very very welcome. Writers are invited to submit either a poem, a short story, a short play, or an essay. Fiction may be, but is by no means limited to, science-fiction. I wrote a flash story especially for the anthology based on the notion of all these extra dimensions. So I am thrilled to have been accepted and am waiting with baited breath to see the anthology, due out in May, and read all the wonderful ways my fellow writers took this theory as inspiration and made something magical out of it. My flash story, Fish-Filled Sea, is Every Day Fiction's story of the day. They have a comment facility so pop by and let me know what you think. 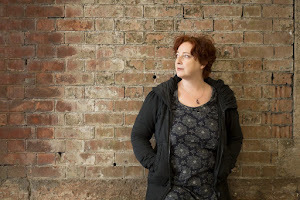 I just wanted to spread the wonderful news that my writing colleague in the Fiction Workhouse and dedicated editor of Cadenza Magazine, Zoe King, will be joining the Salt Publishing stable of authors, and her short story collection will be published in 2008. Congratulations, Zoe! Very well deserved, and very exciting! My short story, Drinking Vodka in the Afternoon, will be broadcast on BBC Radio 4 tomorrow, Wednesday October 3rd, at 3.30pm UK time. It's very exciting - my third story on the radio in three years! And the first story that I wrote for radio. We'll see if it worked. Always slightly nerve-wracking, I never get to hear it in advance. Fingers crossed! It will be available on the BBC Radio 4 website for 7 days afterwards, and then, I hope, I will upload it to my website too, so you can still hear it if you missed it. I belong to two amazing online writing groups: the WriteWords Flash Fiction Group and the Fiction Workhouse , and both those groups are incredibly supportive and inspiring places to be. The WW Flash group has a weekly Challenge, which one group member "wins" and then they set the challenge for the following week. And in the Fiction Workhouse we are now in the middle of something quite wonderful called a Blastette. This is a period of time during which we all write as many flash stories (under 500 words or so, no set rules) as we can inspired by 24 sets of prompts that one member of the group has compiled. This is the third Blastette that has happened since the FW was set up 9 months or so ago, and it is just an astonishing experience. There are 20 of us involved, on several continents, but the energy is palpable. Whenever someone writes a story, they immediately post it up on the site, anonymously, and as well as writing as much as we can, we try and give brief comments on other people's stories. What this has taught me is that the more you write, the more you write. Writing is truly a muscle that will atrophy if under-used, but when kept healthy and given a good workout, is infinitely flexible. During the Blastette, there isn't time to think, there isn't time to listen to that Censor who resides in your head. You just let go, and write. And because you're not investing your all in just one Story, you don't care so much if maybe several flashes don't "work" for you. Something magical will happen in there somwhere, even if it is just a line or a character that you then do something with at a later date. What working in both these groups shows me too is the power of taking inspiration from a prompt. I did, to my surprise, once have a conversation with someone about prompts who said "But isn't that cheating? Shouldn't you come up with the ideas on your own?" Does anyone come up with an unprompted idea for anything? We don't live in a vacuum, we don't just lie on our beds and contemplate the ceiling waiting for inspiration to strike. Prompts are all around us, and these exercises are just honing this, giving it some focus, encouraging it. No two people will ever write the same story from the same prompt. That is what is beautiful. The prompts may be the same, but we aren't. And it is wonderful to see the directions people go in. This Blastette we are in right now is still ongoing (it's actually a 48-hour one, and we each drop in when we can), so I'd better wind this up and go and write more. I just wanted to share a little of the energy, and to thank my groups. Inspiration is everywhere.